Bird, played with outstanding wit by Jade Pettyjohn, has more on her plate than your typical twelve-year-old. On top of looking after her irresponsible stoner mother (convincingly played by "Battlestar Galactica's" Katee Sackhoff), Bird has just moved from her hometown and lost all her friends in the process. She faces merciless bullying at school, has to deal with her first period, and is faced with an unpredictable relationship between her mom and her sympathetic lover, Arlo (Jeremy Sisto, "Clueless," "Six Feet Under"). 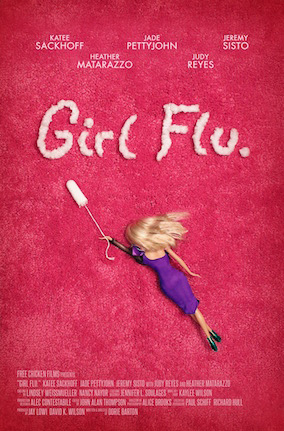 Writer-director Dorie Barton makes her feature film debut with "Girl Flu." She has spent many years as a story consultant with filmmakers from up-and-coming writers to industry veterans. As a professional actor, she has been seen in countless television shows from daytime drama to mutli-cam sitcoms and major motion pictures such as "Down with Love" opposite Ewan MacGregor, and Bobcat Goldthwait's "God Bless America". She graduated from the California Institute of the Arts with a degree in theater and remains a proud member of the Evidence Room Theater Company in Los Angeles.